Miscellaneous material of variable quality. Useful sequences showing steam threshing and ditch digging. Combining, muck spreading and beet loading/washing also feature. The Second Battalion of the Lincolnshire Regiment makes its first visit to the city since 1897. After marching downhill through the Stonebow, the troops are inspected by The Earl of Yarborough, Lord Lieutenant of Lincolnshire. Round the year on a farm in the Lincolnshire Wolds, mainly arable (wheat, barley, beet), but sheep are also kept. An attractive film, compiled over several years, which proceeds at an unhurried pace with a thoughtful and reflective voice-over by the farmer himself. The year of the great drought, and later of high winds. A farmer reflects on the difficulties extreme weather conditions caused him. Good countryside scenes, with close-ups of insects, etc, and many views showing the aftermath of drought, fires and storms. Filmed on the same farm as ‘Furrows’. A plea for better management of the soil. 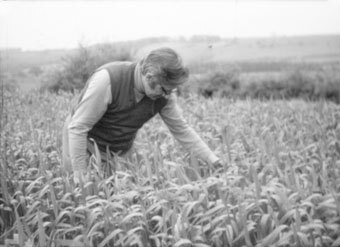 Scenes of tenant farmers still using horses and hand tools are contrasted with large-scale mechanical techniques and factory food production. 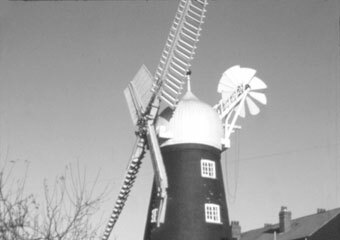 Notable sequences include a water mill grinding corn, a sugar beet plant, and a frozen pea factory. A husband and wife, tenant farmers on 26 acres in Moulton Marsh, who still used only horses. They are seen ploughing, drilling, harvesting oats with scythe and pitchfork, and harvesting mangolds into a horse-drawn cart. Note: the same couple are seen more briefly in No 425. Tells the story of Tennyson’s boyhood and early manhood in Lincolnshire, using contemporary prints and scenes filmed in the relevant locations, linking these to extracts from his descriptive poems. There are also a few discreet ‘reconstructions’ in costume (e.g. a distant solitary cloaked figure seen pacing the windswept shore). Attractive location shots, with clear, informative narration throughout. * Note: A sound track is believed to have existed but is not at present held by the Archive. Miscellaneous surviving out-takes from the production of No 428. Some are of scenes not included in the main film, or apparently superior to those actually used. Excavation of a site in Broadgate, Lincoln, by the Lincoln Archaeological Trust. Work on the site is shown and explained. Finds are then seen being sorted, cleaned, catalogued, drawn to scale, etc. The voice-over includes explanatory comments by those seen doing the various jobs. A very clear and thorough picture of the work is given. Life in Roman Lincoln reconstructed in great detail, using museum exhibits, Roman remains in and around the city, and convincingly drawn artist’s impressions. 432 WHAT DO I SEE? Detailed and elaborate reconstruction of life at and around a large country house in the early years of the Civil War. Enacted by members of the Sealed Knot, but largely concentrating on domestic rather than military subjects. The voice-over takes the form of readings from the (fictional) diary of the lady of the house. The film follows students on a VI Form Art course at Freiston Hall, Boston. Much of the time is devoted to showing the students’ own artwork in relation to the actual subject matter depicted, but there are a few scenes in and around Boston itself. The artwork is impressive, but the electronic music on the sound track is a sore trial. Half a dozen secondary pupils on a field-trip study soil and plants. They collect specimens of various kinds, measure the length of dune grass roots, etc. Members of the British Ornithological Society set up their nets in Willingham Woods, and ring the captured birds before releasing them. In a later sequence, another team is seen weighing and measuring the birds as well. A Steam Rally at Hawerby Hall Farm, with traction engines, models, roundabouts, etc. The sound track features authentic location recordings. Lengthy (and somewhat repetitive) compilation of personal material, mostly shot on board various small sailing yachts on many different parts of the river. Maps indicate the location of each section. Good scenes of yachts being hoisted in and out of the water at Ferriby on the River Ancholme and passing through Ferriby Lock. Some useful scenes of river craft, and the Humber Bridge at various stages of construction is often visible in the background. Dinghy racing (mainly Enterprise class) at the North Lincolnshire Sailing Club, chiefly at their home venue, a water-filled 40 acre former clay pit. Good, lively, medium-close footage, though to the non-enthusiast it inevitably seems repetitive. Rural scenes, general views of countryside, village, etc, mostly taken in either Spring or Autumn. There are some useful agricultural scenes, and a water mill is seen working. 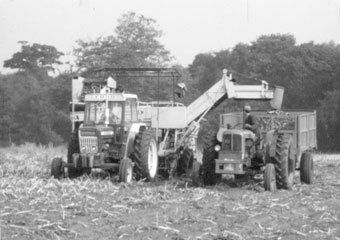 The film finishes with a Ploughing Match.